Seán McDermott—or MacDiarmada, as he styled himself—stands out as one of the key architects of the 1916 Rising, which was to lead to an independent Irish state in 1922. Yet, as Gerard MacAtasney claims in this excellent biography, his contribution to the rise of the new nationalism and Easter Week has tended to be obscured by those of his co-signatories, Patrick Pearse and James Connolly. As his IRB associate Denis McCullough noted many years later, MacDiarmada was ‘the common multiple of all the organisations behind the Rising’. Michael Collins saw him as a central transformative figure, ‘spreading the Fenian gospel’ throughout Ireland and coordinating IRB activities in Britain and the United States. Born on a small farm in rugged north Leitrim in 1883, MacDiarmada’s short life spans the rise of the Gaelic League and Sinn Féin and the revitalisation of militant republicanism in that ‘crease in time’ between the fall of Parnell and the insurrection. MacAtasney shows how MacDiarmada’s political education began with his absorption into the shadowy world of separatist politics in Edwardian Belfast. His arrival in the north’s soar-away industrial city in 1904 to work as a tram conductor brought this bright, charismatic young man into direct contact with the ‘Young Turks’, Bulmer Hobson and Denis McCullough, who were then bent on relaunching the IRB. The Down Quaker Hobson and the Falls Road Catholic McCullough were joined by MacDiarmada, then a member of the sectarian-based Ancient Order of Hibernians, in setting up the separatist Dungannon Clubs in Ulster after 1904. It was the Belfast activists who initiated MacDiarmada into the IRB. Republicanism made little headway in the early 1900s, when the home rule leaders, Redmond and ‘Wee Joe’ Devlin, commanded the allegiance of the mass of Irish nationalists. However, MacDiarmada’s organisational and oratorical skills saw his transfer to Dublin in 1907 as national organiser of the Sinn Féin League—an amalgamation of Arthur Griffith’s tiny monarchist party and the Dungannon Clubs. The new movement incurred the wrath of Devlin’s Hibernians. ‘The Ribbonmen are giving us the devil’, Hobson told the Irish-American Fenian Joe McGarritty in 1908. Any hope of a Sinn Féin breakthrough was dashed by the party’s defeat in the North Leitrim by-election in 1908, in which MacDiarmada played a leading part. This reverse marked a turning-point in Sinn Féin’s fortunes and in MacDiarmada’s interest in electoral politics. As MacAtasney states, the return of the old Fenian Tom Clarke to Ireland in 1907 marked the real beginning of MacDiarmada’s career as a revolutionary. The two men forged a close friendship and together began the work of galvanising the physical force movement for the armed uprising to come. By 1911, MacDiarmada, Clarke and the Belfast men had successfully overthrown the effete IRB ‘old guard’ in favour of a younger, single-minded leadership. However, the introduction of the third Home Rule Bill by the Liberals in 1912 seemed to put paid to any prospect of violent revolution. Like Pearse—then a cultural nationalist—MacDiarmada viewed home rule as a stepping-stone towards full independence, though he feared that an Irish parliament would sound the death-knell of the IRB. As MacAtasney points out, it was the ‘Ulster crisis’ and the rise of ‘Carson’s army’ during 1913–14 that effectively rescued the IRB project. Eoin MacNeill’s seminal article ‘The North Began’ was eagerly seized upon by the militants as a call to arms. The result was the formation of the Irish Volunteers in November 1913. This mushrooming nationalist force provided MacDiarmada and his revolutionary comrades with the necessary strikeforce for the rising they were determined to stage once Britain was embroiled in a European war. When the split occurred in the Irish Volunteers in 1914 over Redmond’s support for recruitment, MacDiarmada and his associates kept their place and began to make final plans for the insurrection. MacAtasney cites F. X. Martin’s description of the Rising as ‘a conspiracy within a conspiracy in the conspiracy of a minority’ and stresses the historian’s emphasis on the role of MacDiarmada in the drama:‘… if any single person is to be given credit for acting as stage manager of the drama enacted in Easter Week 1916 it is Sean MacDiarmada’. By this stage, MacDiarmada, who had been crippled by polio in 1912, was a key player in the final preparations for a military strike. It was he who introduced Pearse to Clarke and so brought the Gaelic revivalist into the heart of the conspiracy. In the fraught atmosphere leading up to the Rising, Hobson was sidelined by his former colleagues Clarke and MacDiarmada, the socialist Connolly was persuaded to cast in his lot with the IRB, and the Volunteers’ chief-of-staff MacNeill—a ‘respectable front man’—was deliberately deceived by the adroit use of the (probably forged) ‘Castle document’ of April 1916. Denis McCullough recalls a crucial IRB meeting in Dublin around 1915 to elect a chairman of the supreme council. The Belfastman had intended to propose Pearse for the position when he was warned off by MacDiarmada, who had a secret agenda: ‘He said to me “for God’s sake shut up . . . sure we could never control the bloody man . . .” ’. (Pearse, McCullough noted, was ‘up in clouds’.) In the event—to McCullough’s surprise and consternation—MacDiarmada proposed him for the post and he was duly elected, despite his protest. As MacAtasney observes, McCullough’s appointment was ‘undoubtedly a ruse’ designed to leave the MacDiarmada/Clarke axis in control of the IRB. MacDiarmada’s involvement in Easter Week and his role in persuading the fractious Moore Street garrison to surrender are chronicled by the author. The young Leitrim man had a mesmeric effect on the bewildered Volunteers, faced with the harsh reality of defeat and surrender. As one of their number, Joe Good, later recorded, he was seen by the rank and file as ‘the mind of the revolution’. As early as 1915, MacDiarmada had told the IRB figure P. S. O’Hegarty: ‘We will hold Dublin for a week and save Ireland’. On the eve of his execution on 12 May 1916 he seemed confident that the Easter ‘martyrs’ would triumph from their graves: ‘The cause for which I die has been rebaptised during the past week’. MacAtasney’s account is no less interesting for the light it sheds on the tensions within the IRB and the broad separatist movement. For example, MacDiarmada distrusted Griffith and strongly disliked Pearse, accusing him of ‘seeking the honour due to others’. In addition, he shared the narrow political mindset of the IRB, eschewing any interest in social reform. Dr MacAtasney has produced an assiduously researched and vibrant biography of this significant leader of the Rising. He has left no archival stone unturned in his quest for sources in Ireland, Britain and the United States. Of particular historical value are the newly available witness statements of 1916 veterans and a series of letters from the subject to his girlfriend, Min Ryan (who later married Richard Mulcahy). 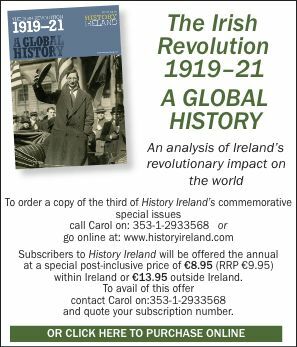 This work makes a useful addition to the historiography of the Irish Revolution.